Show your colours (next) Australia day, or gift an international visitor with this kitschy Kangaroo necklace. Here's a little secret- it looks amazing under blacklight. With its clear gold and its opaque green it is a nice way to show your patriotism without resorting to boganism. 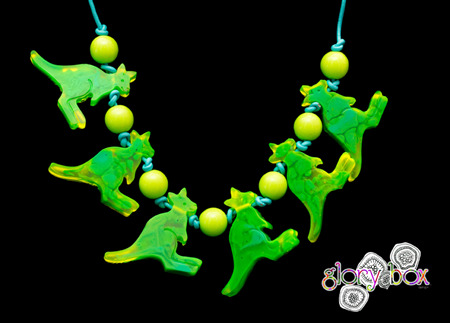 Six little roo's all strung on an adjustable aqua leather strap and lime beads...it's another Glory Box winner. It has a finished length of 30cm and could be worn at the beach, in the club or just thrown on at a whim. A warning though, people will want to eat it. Good Luck!